The service provider has collaborated with several medical facilities and pharmacies through which the member can get services. The membership is free, and you do not need to subscribe monthly like insurance covers. The only cost you as a member will be subjected to is that of the actual service or product. 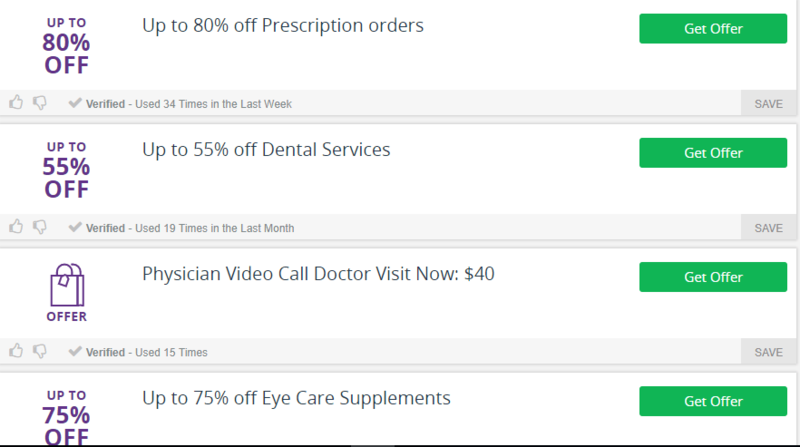 Singlecare.com claims to save the client up to 50%. You can use single care to purchase drugs from selected online pharmacies. For the case of buying your prescription from the online pharmacies, you will make your orders through the single care platform. You also get to pay for the drugs through the platform. With the card, you have the autonomy to choose your preferred service provider. The price you pay for the website caters for everything. Single care guarantees you pre-negotiated rates, reduced financial risks, relaxed administrative burdens and fewer costs. It has not been all roses for Single care services. It has had to contend with some politics of scam allegations directed at it at some point. It was reported that the website was breaching the policy of customer details non-disclosure. That, they collected emails and other personal information, which they later handed over to a third party for marketing purposes. Customer reviews serve a crucial purpose for any service, product, or company. It is through them that you can get a glimpse of what you can expect from a prospective client. Excellent customer feedback gives confidence and can influence one to buy. On the contrary, poor ratings will always keep away the potential buyers. Independently published customer reviews are preferred for their impartiality compared to those on the vendor’s website. The available customer reviews for the Single care are a mix of both positive and negative comments. Below are excerpts of some of the independently published customer reviews. 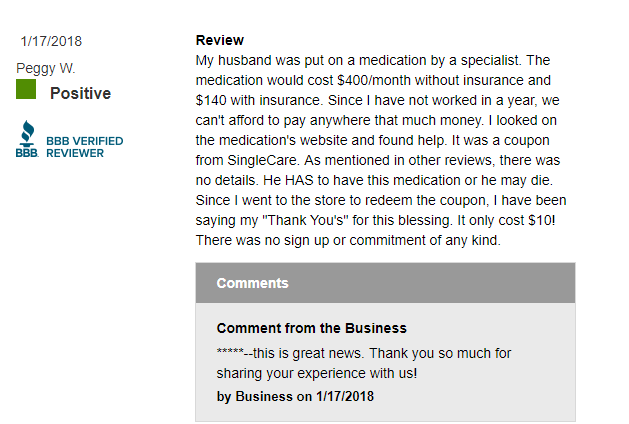 One customer named Peggy says she used the card for her husband’s medication and it was a significant relief for them because it brought down the overall cost of medicines to a level they could afford. The medication she received, however, had no details which is against the standard practice. 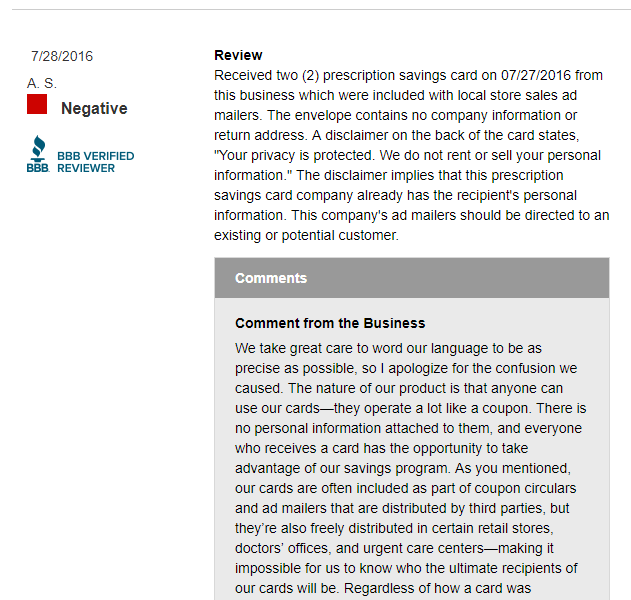 Another reviewer says he saves big when he uses the single card service to purchase his drugs. He says goes ahead to point out that his friend has one and suggests that he is convinced that the card is good. The third reviewer complains just like the first one that there were no details about the company on the delivery hence making it impossible in case of any urge to return the medication. Most of these reviews have a reply from the company which shows the concern to sort out any arising complaints. Note that the information above is only meant to shed more light on the subject and not to endorse or oppose. You can always seek expert advice from relevant people and institutions if need be. Anyone can own a Single care card. The membership is free, and there are not premium subscription that comes with medical insurance firms. This makes Single care unique from the rest. Those with stable jobs as well as those without can be members and it comes with some benefits. With the card, you are guaranteed better drug prices and less administrative burdens. You will be able to see a doctor online after booking an appointment through the single care website. It covers medical conditions such as dental health, prescription drugs as well as mental health among others. The card will require that you chose one vendor from which you will seek services from. Customer rewards are one thing that most companies use to keep their customers. It can be implemented through several approaches. It can take the form of coupons, discounts, and other offers. Single care too has its way of appreciating its members in partnership with the various service vendors of course. Single care uses offers. The members benefit from reduced prices to services they need. The cost drop depends on the type of the service one is seeking. Those seeking to purchase prescription drugs have a discount of up to 80% in the 2018 promotions while those seeking dental services have an offer of 55% discount. Walmart accepts single care cards. This means the members can purchase their drugs from Walmart at any time. This deal comes with a discount of up to 80% on medications. Walmart is among other vendors like Walgreens, Kroger, Harris, CVS, Duane Reade and Rite Aid among others that have partnered with Single care. 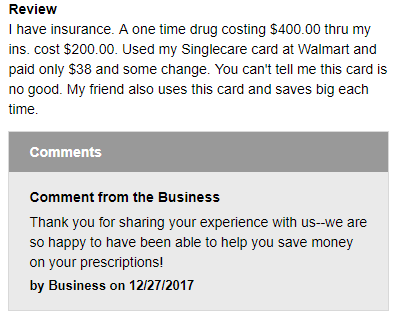 Using your membership, you can purchase through the Single care platform the drugs from Walmart but with reduced prices. You will pay through single care website. Most of the services you will require will be facilitated through the site including complaints. Note that once you choose Walmart as your vendor, you may not order from any other vendor until you make the changes with Single care. Single care is a medical service that links the patients to health service providers like the pharmacies, health facilities, and doctors. Membership is free of charge, and anyone can join. Members can seek services of institutions that have collaborated with Single care through their website. Payment is effected through single care. All the drugs sold by the various vendors have been approved by the Food and Drug Agency. You should take care of your details especially the sensitive ones. When purchasing through the site, it is essential that you take time to identify an accredited vendor to order from. You can narrow down to those drugstores with the excellent reputation. Check with our top-rated pharmacies for your supplies.